« Wedding Bells for Nurse Connie. Ten things we did in the 50s we don’t do now. Now the reason I’m so into history is because I love to discover little details and marvel at the difference between the life I live and times past. Usually these are quite marked changes such as in clothing or innovative technology but for me some of the most interesting aspects of change are the little things that almost go unnoticed. My new book Wedding Bells for Nurse Connie isn’t set that long ago, relatively speaking, just as the NHS started in 1948 and it would be easy to highlight any number of things that have changed radically since that time. Fashion, communication, transport and medicine, but I’d like to concentrate on some little everyday things that seem to have changed unnoticed. 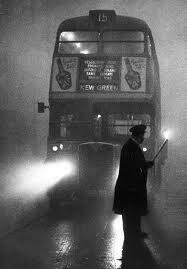 London used to be notorious for it smogs and even gave the capital its nick name of the Smoke. It had been a problem since Victorian times and Londoners were used to dealing with it but the Great Smog of 1952 was a catalyst for politicians and health official to do something. A combination of weather conditions and an increase in coal consumption caused the densest and one of the longest fogs recorded. It caused havoc to the capital’s public transport and seeped in to houses and public places causing cinemas and theatres to close. But the most serious effect was on the health of the population. It claimed the lives of over 6000 Londoners and impacted on the health of another 25,000 although modern researchers put the death rate from the 1952 smog nearer 12,000. It ultimately led to the 1956 Clean Air Act which finally consigned the London Smog to history. Babies left outside shops in prams. The very thought of leaving your child unattended for a nano second let along while you get a week’s worth of shopping sends shivers of anxiety through modern parents. 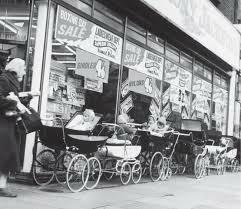 However, it was quite common place to see row upon row of prams all with a little occupant sitting up in them outside shops. Arguably, it was more dangerous in those days because many unmarried mothers were coerced to give up with babies so not a week went by without a baby being snatched from its pram by some poor woman suffering from post-natal depression. Vegetable in season or with insects in them. With the supermarket shelves loaded down with exotic fruit and veg from all four corners of the world we never actually have to wonder what’s in season. But in Connie’s day strawberries, cherries, lettuce and tomatoes were in the shops for a very short period in early summer and then that was the last you saw of them until the following year. 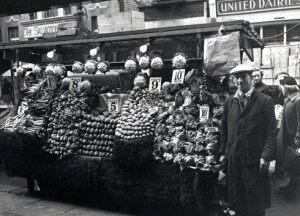 Also today as most fruit and vegetables are grown in almost sterile conditions no one now finds a maggot in their apple or a creepy-crawly in the lettuce. Women collecting their meat each day from the butchers. 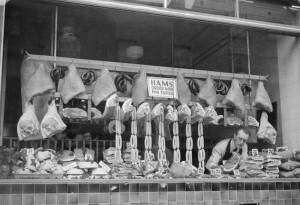 Only the wealthiest 10% of households owned refrigerators in post-war Britain so most woman bought their meat on Friday or Saturday from the butcher and collected it on a daily basis. Even by 1960 the number of domestic fridges had only risen to 33% so I have Connie constantly worrying if she will be off work in time to pick up the meat from the butchers. People who only washed their hair once a week. Today most of us get straight out of bed and into the shower but I’m sure you’ll gasp in disbelief when I tell you that in the 1950s most people made do with a strip wash in front of the kitchen sink each day before work and before they went to bed and reserved the rigmarole of heating water for a bath for once a week, usually Friday. This meant that people only washed their hair once a week. For women the ‘I’m washing my hair that night,’ line became a brush-off for an unwanted offer of a date. 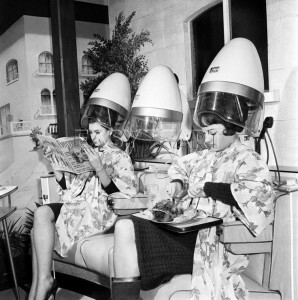 Although women permed and coloured their hair at home before Vidal Sassoon introduced us to blow drying, all the way through to the 1970s the Saturday morning trip to the hairdresser for a wash and set was a must for most women. It was a communal gathering where gossip was exchanged, husbands, mother-in-laws and other relatives were moaned about. The shops were often called something vaguely foreign and glamourous like Gina’s or The Shangri-La Salon. 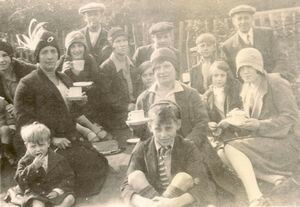 Luckily this weekly trip coincided with Saturday morning pictures so after giving the children 6d each for entrance and 3d for a bag of sweets mother would head off to the hairdresser for her weekly hair wash. Packs of dogs let out for the day. Unlike dog-owners of today who often employ mid-day dog walkers or sitters if they are at work almost everyone who owned a dog in the 1940s got around this problem by just letting their dog out to roam the streets all day. 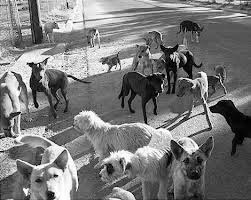 As late as the 1960s it was common place to see dogs either singularly or more often gathered together sniffing around and scrapping with each other while their owners were at work. This might sound bizarre to a generation that doesn’t understand the term ‘darning’ let alone how to do it, that women would repair their stocking. Even after the clothes rationing finished luxuries such as stockings remained in short supply and very expensive. To go out bare- legged was considered to be very brazen so a respectable woman wouldn’t have left the house without wearing a pair of stocking even if that meant they had stitching running up their legs. 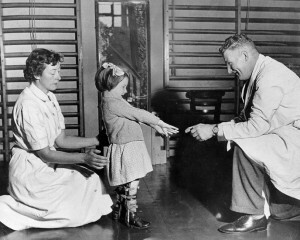 I remember as a child my mother darning her nylons to make them last another few days. Making your own clothes today is regarded as a craft hobby but in Connie’s times women made much of what they wore. It was essential to make the clothing coupons and family budget stretch that little bit further. 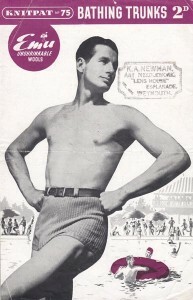 There had been a government campaign encouraging women to make over old clothing with Mrs Sew & Sew and Make do & Mend. 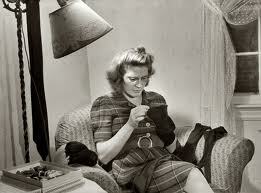 Women would also knit their own jumpers and unravel old ones to reuse the wool. 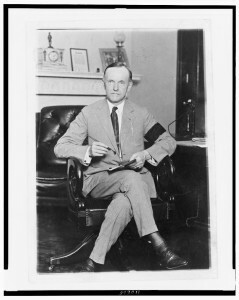 People wearing a black armband. 5 Responses to Ten things we did in the 50s we don’t do now. remember the black armbands into the 70s… I expect the tradition has died out because people now can afford a black outfit/suit. back then it was a cost effective way of wearing mourning clothing as the price of a new suit would be prohibitive. ..
Oh yes – we walked to and from school and couldn’t see ten feet in front of us, because of the smog! And didn’t we soak cauliflower in salt water to get the insects out? Reading this brought back memories for me again. Seeing the rows of prams outside the shops with babies still sitting inside – horror comes to mind these days, but I remember my mum telling me back in 1949 she left me outside Woolworth in Elm Park, she walked all the way over the hill passed the station to home, only then did she remember she had left me there!!! She rushed back, and there I was still sitting there happy as anything. She didn’t do that again. I love this post, Jean, and the photos are wonderful too. To imagine that prams were left outside shops with babies in them (read a novel on a baby being taken in that situation once, think it was by Anne Tyler), and that lettuce and strawberries could only be bought in the summer! ha ha, I still mend my tights!